Aiken Civic Ballet Company | The Aiken Civic Ballet is South Carolina's longest continuously operating dance company. 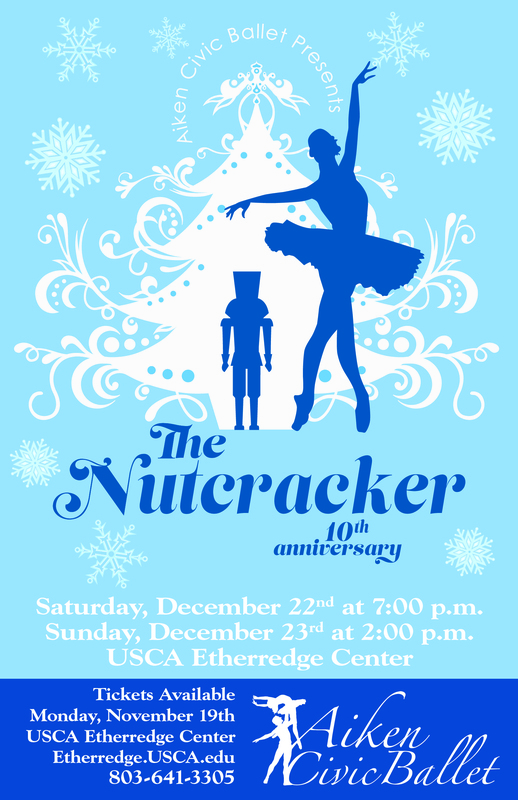 Join the Aiken Civic Ballet Company for the 10th anniversary performance of The Nutcracker. Performances will be held at The USCA Etherredge Center, 471 University Pkwy, Aiken, SC on Saturday December 22nd at 7:00 PM and Sunday December 23rd at 2:00 PM. Call (803) 641-3305 to order tickets, or purchase online using the link below. The Aiken Civic Ballet is South Carolina’s longest continuously operating dance company. Founded by Carl Crosby, the company has been in existence for over 48 years. Under the Artistic Direction of Diane Toole Miller, the company produces original ballets and contemporary dance works. The Aiken Civic Ballet is a 501 (c) (3) non-profit organization. The mission of the Aiken Civic Ballet Company is to encourage dance as an accessible and vital art form, to promote outreach education by facilitating the development of important life skills through the discipline of dance, and to provide premiere training and performance opportunities for young dancers in the greater Aiken area and beyond. Diane Toole Miller has been the Owner/Director of the Crosby-Miller School of Dance since 2006. She has over 35 years of professional dance experience – as a Soloist with the Augusta Ballet under the direction of Ron Colton (formerly of New York City Ballet) and over 35 years teaching experience -teaching classical ballet to all ages. Diane was born in Aiken and began studying ballet at age 8 under Carl Crosby. She joined the Aiken Civic Ballet at age 13. In July 1978 she was crowned Miss South Carolina, one of the youngest to ever win the title, and went on to compete at the 1978 Miss America Pageant where she received a Talent Award Scholarship. After attending Converse College and USCA she received a B.A. in English. She studied with Barbara Ferguson at the Spartanburg Civic Ballet, and danced with the Orchesis Modern Dance Theater and televised performances with The Miss SC Pageant Dancers while in Spartanburg. In 1982 she joined the Augusta Ballet, performing many ballets including Symphony 13 and Episodes by Duncan Noble, Tilt by Stanley Zompakos, A Place To Dance, Bagatelles, A Gift To Be Simple, and Hearth of Embers, as well as dancing in Nutcracker as the Dewdrop Fairy, in Coppelia, Les Sylphides and in Augusta Ballet’s first Balanchine Ballet, Valse Fantasie. She danced in many Gala performances of SERBA (Southeastern Regional Ballet Association) including Charleston, Miami, and Atlanta with the Augusta Ballet as an Honor Company. She previously taught ballet at USC Aiken and has enjoyed choreographing ballets for the Aiken Civic Ballet which include the Nutcracker, Korean Cinderella, Snow White, Alice in Wonderland, Aladdin, and La Boutique Fantasque. Diane is married to Charles Miller and they have 3 daughters. The members of the Aiken Civic Ballet train at the Crosby-Miller School of Dance, located at 142 Greenville Street SW, under the direction of Diane Toole Miller. Donations are vital to ensure the growth of this outstanding ballet company and continuation of its cultural and educational mission. You may support the ballet through our Corporate Sponsorship or Family/Small Business Sponsorship programs. You may also use the button below to send your donation to the Aiken Civic Ballet. We appreciate your support! All contributions to ACBC, a 501(c)(3) organization, are tax deductible as allowed by law. Partner with ACBC and sponsor the performance of your choice for $5,000 or more. Sponsor a guest artist to perform with the ACBC, or to conduct a workshop for ACBC and other dancers in our community. Support ACBC pre-professional dancers attending summer intensives across the country for a contribution of $500 or more.